Over the last month I did a bit of test knitting for my friend Elly of Elly's Knit Insanity. Elly has a video podcast in the UK and she also has health issues, so we are able to understand each other a little better than most. Elly asked me to test knit one of the series of patterns she has been working on and I was delighted to be able to help. 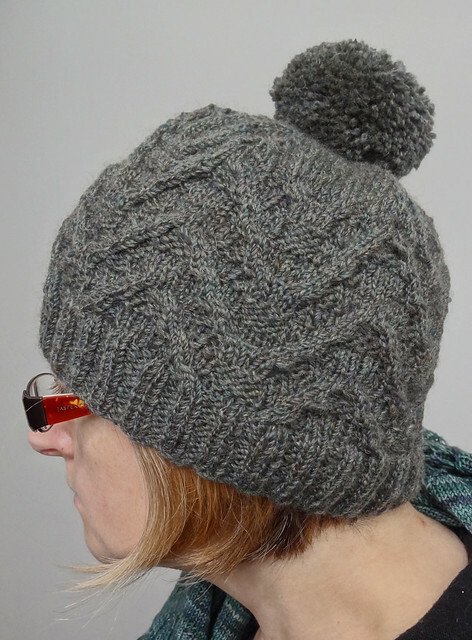 The pattern is a cabled hat and it is called Determination. I started out doing the pattern in Rowan DK and was only able to get a couple of rubbish snaps on my camera phone before passing it on to my Dad who does like the hats I make him. I liked the pattern so much I decided to make another one and keep it for myself this time. I was able to use some of my handspun yarn, which was a treat, as I've not used much of it, so far. The yarn I used, was spun from a Hilltop Cloud blend called Mallard. I spun the fibre in the Tour de Fleece this Summer and I really like how bouncy and soft it is. It is a DK weight and I had more than enough yardage for the project, as I had a total of 184m. The fibre is 62% merino/25% BFL/13% baby alpaca which makes for an interesting texture and the bounce seemed perfect for cables. I used the alternating cast on, described by Liz Corke, which gives a nice elastic edge and is simple to do and has become my preferred method of performing a ribbed cast on. The cable chart is nice and straight forward without being boring and I whizzed through the hat in no time flat. It was lovely knitting with this handspun yarn and I love how the blended fibres transform the resulting knitted fabric into something multidimensional, rather than a flat solid colour produced by block dyed fibre or yarn. 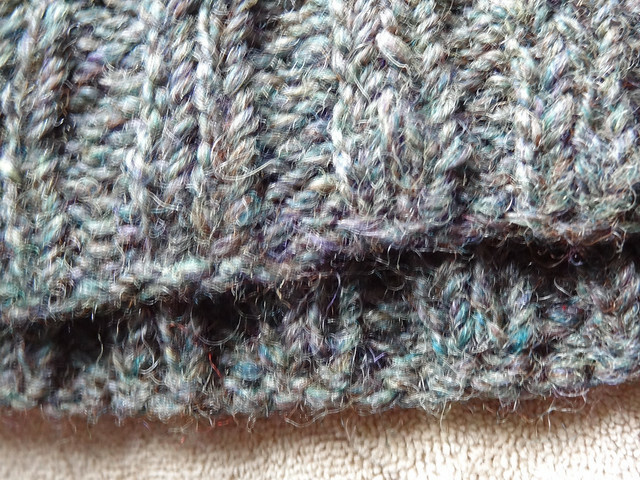 I used 3.75mm needles to get a fabric I liked, as I have a loose gauge, and did three repeats of the chart. The resulting hat is quite a nice fit on my 21.5" head, as it is not tight, but will not fly off either. 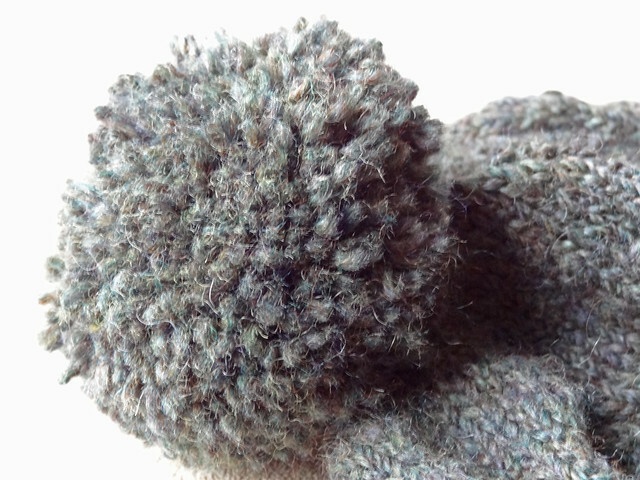 I decided that as I had lots of yarn left over from the knitting of my hat, I would use the remainder to make a pom pom. I used a Clover Pom-Pom Maker and it took less than 10 minutes to make this very plump and beautiful pom pom. I love this clever little gadget and have several sizes. As soon as I had sewn on the trimmed pom pom, I knew it had been the right thing to do. This lovely fat pom pom sets off the rest of the hat beautifully. The pattern is available for immediate purchase and download, on Ravelry for £2.50. 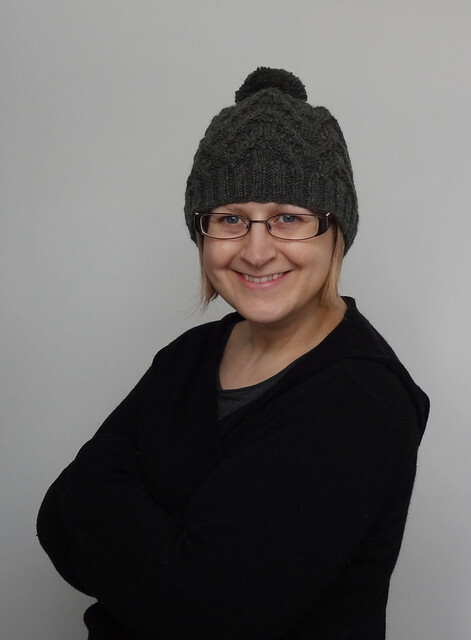 It's a lovely hat, which I enjoyed knitting, and love wearing. I may well knit up another one is a bolder colour next time, but I still love how the handspun yarn looks and think that the pattern shows it off excellently. I really must find some more patterns to show off my growing pile of handspun yarn! Does anyone have any suggestions?